Is it necessary to X Ray Heel Spurs to get effective treatment ? X Ray heel spurs – is it necessary? Is it necessary to X Ray heel spurs to confirm the diagnosis? When you come to see the podiatrist, it is generally not required to have an x ray for heel pain. Although a spur may be present on your foot, it is not very relevant to the treatment. If you have pain, you need treatment to feel better. Whether you have a big heel spur, a small heel spur or none at all, you will undoubtedly want to be rid of your pain. For this reason, we would say that to X Ray Heel Spurs is not necessary. If you have not already read our Plantar Fasciitis Information, this page contains all of he essential information about this condition. Come back and read more about whether to X Ray Heel Spurs after covering off these basics. To briefly recap, plantar fasciitis comes about when the pulling / elongation strain on the band is too great and damage occurs. Why wouldn’t an X Ray of Heel Spurs be important ? Looking at the adjacent X Ray, you will see that the spur points forward in line with the fibres of the fascial band. It doesn’t point down to present its pointy end into the flesh. Lots of people have spurs and no pain and plenty have pain and no spurs. To have a heel spur like the one shown, you will have been growing the spur for a decade. Why would the spur hurt you today and not last month? The spur would have been almost identical as it appears today. After successful treatment for your heel pain, when you are pain free, your spur remains just as big. 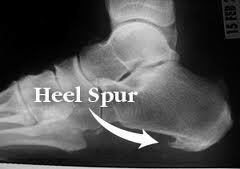 So, for the majority of people suffering heel pain, we believe that the spur has little relevance. Occasionally, the morphology of the spur (the bone shape) might be a more important factor. This does seem rare, based on the high rate of symptomatic relief achieved with proper treatment. What a well developed spur does tell us is that the problem is long standing. Ultimately, we believe that it comes down to this. The pulling of the plantar fascia at the point of its bony insertion causes the pain. The pulling also causes bone response that grows the spur over time. The spur does not cause the pain. So, regardless of whether you do or don’t have a film X Ray Heel Spur, or whether an X Ray shows a spur or not, the early treatment is exactly the same. Unless the condition is complicated in any other way or fails to get better as expected, the podiatrist won’t generally require x rays to investigate your heel pain. Indeed, pointless X Rays cost you and your community a lot of money and irradiate your body for no good reason. If your podiatrist ultimately decides that we do need further investigation of your heel pain, we usually like to be very specific about what images are taken – or request an ultrasound instead. X Ray and Ultrasound investigations are covered by Medicare when ordered by a podiatrist.